Your baby is a bundle of joy, but she does sleep at strange times, and wake up at the most awkward ones. Doesn’t she? Just when you are ready to drop from exhaustion, and contemplating a good long sleep, you hear that familiar wailing and there you go again! Baby sleep patterns are notorious for not being parent friendly. While one can easily understand the new parent feeling persecuted and wronged by the way baby refuses to sleep through the night, what one needs to keep in mind is that there are very good reasons for the way that babies sleep. For one thing, infant sleep patterns haven’t yet settled down into a mature circadian rhythm. Newborn babies can’t contrast day and night, and tend to sleep and feed in two to three hour intervals around the clock. Although the baby sleeps as much as 18 hours in every 24, a parent can feel like all they ever seem to do is feed. Baby sleep patterns are different in other ways too. Compared to your sleep patterns, babies have shorter and simpler patterns. Their cycles are only 50-60 minutes as compared to the adult 90-110 minutes. Also, it is divided between only two stages, active, and deep sleep. During the active sleep state, eyelids flitter, breathing is rapid and irregular, baby moves a little, and grunts or makes other sounds. Half way through the cycle, the baby passes into deep or quiet sleep with slower, rhythmic breathing, no fluttering of eyelids, and no movement. For a parent, active sleep, where the baby can be easily awakened is a bit of a pain. But it is important for the development of the infant's brain. The active phase of baby sleep patterns is also safer in many ways. Being easily awakened is the thing that parents most complain about, but it has survival benefits. Babies' needs are highest in the first few months of life, but the ability to communicate is lowest. As a result, a deeply sleeping baby would have needs that remain unfulfilled. If hunger cannot wake her easily, she would go hungry, and lose out in the race for growth and survival. If the baby is unable to breathe, cold, or in some other discomfort, deep sleep without easy waking would put her at risk. 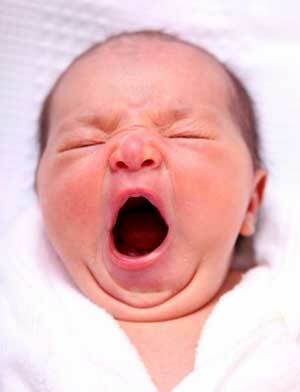 The active sleep phase of infant sleep patterns actually protects babies. The light sleep phase of baby sleep patterns helps the brain to develop rapidly. The infant's brain does not rest in this phase, and blood flow to the brain can actually double during this time. The body produces more nerve proteins to build up nerve cells, and processes information collected while the baby was awake. This is when the brain does its homework, keeping the useful info and discarding the trash. So, in essence, this is when the brains grow most rapidly, and learning and memory take place. Does this mean you should not make any effort to change what is preprogrammed? Not really. You can make minor adjustments to help your baby, and yourself, sleep better and longer at night. As the baby grows, she will automatically begin to acquire more adult sleep cycles. Until then, you can teach her that night time is different from day by behaving differently at both times. Make daytimes stimulating by talking to her, playing with her, being noisy, and making the home bright. At night, create a more subdued, quiet, and less well lit ambience.